Near Ancona on the Adriatic Sea. A modern copy of the original statue, lost in a fire in 1921. 3ft, wood. Part of what made the Madonna of Loreto world famous is the house she came in. It is a dark, little brick house called the Holy House of Mary, because it is believed to literally be the house where the Virgin Mary lived in Nazareth. Luke says, the Angel Gabriel was sent to her town and "came in unto her, and said, Hail…" (1:28). That is to say, he went into her house and right then and there, through his prophecy and her consent, "the Word became flesh." It is presumed that at the time men still moved into the houses of their wives, so that Jesus and Joseph would have lived in this same House of Mary. It was honored as a sacred place of pilgrimage from the first days of Christianity. In the 4th century Emperor Constantine built a basilica over it, with Mary's Holy House forming its crypt. So how did it get to Italy? Well, Muslim forces destroyed many Christian shrines when they first invaded the Holy Land and again later, during the Crusades. The basilica over Mary's House was reduced to ruins twice, but each time the crypt containing the home of the Holy Family remained untouched. By 1291, the Crusaders had definitely lost the war and it seemed only a matter of time until Mary's house would be demolished. At that point, it suddenly disappeared from Palestine and showed up in Europe, containing, as one report says, a "strange" (i.e. black?) statue of the Virgin. Finding a place where the building and the pilgrims who wanted to visit it were secure proved a difficult task, even for angels! For three years the house blessed Tarsetto, in modern Croatia, with its presence, until the Muslim invasions reached that place also. Then the house tried its luck in Italy, but even on such Christian soil it took a while to find a truly safe harbor. First bandits disturbed the peace, then a pair of fighting brothers on whose land it had settled. But on the fourth try, on December 10th 1294 it finally found its resting place in Loreto, where it remains to this day. This sounds like a crazy story, and yet there is supporting evidence for its veracity. Even medieval Christianity possessed a healthy dose of skepticism. When reports spread that a house had appeared over night in a desolate place and holy men had had dreams and visions about it being the Holy House of Mary, committees were formed. Not once but five times the house was investigated in its present location as well as its foundation in the Holy Land, in 1292, 1296, 1524, 1871, and some time between 1913 and 1922. The results confirmed that: A) There used to be a house in Nazareth venerated as Mary's House. Many pilgrims described it in letters and diaries until the year 1291. After that only the grotto which formed one part of the house is mentioned anymore. B) The dimensions of the house in Loreto matched those of the foundation in Nazareth. C) The style, the bricks, and the mortar of the house in Loreto are not Italian but Palestinian. D) The house stands without a foundation on ground which used to be part public road, and part the ditch and field next to the road - not a place where humans would construct a building. E) Countless miracles took place in this little house, confirming its spiritual potency. 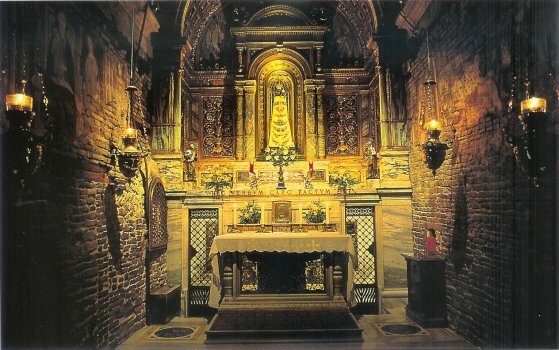 (*1) : Academy of the Immaculate: "Marian Shrines of Italy" New Bedford, USA, : 2000, pp. 47-49. 30 pages are dedicated to the sanctuary of Loreto.